In a food processor add the ginger, turmeric, garlic, chillies and oil and blitz on high to form a smooth paste. Place a wok over high heat and heat 2 Tbsp. oil until shimmering. Pour in curry paste and fry off for approximately 5 minutes until aromatic and steam no longer rises from the mixture. Bash the lemongrass with the back of a knife to break the fibres and add into the wok along with the kaffir lime leaves and galangal. Add in the coconut cream, stock, fish sauce, tamarind pulp and palm sugar. Bring to a light boil, reduce heat to low and simmer for 10 minutes to infuse the flavours. Set aside. Heat 2 Tbsp. oil in a large pan over medium-high. Season fish with salt and place in the pan, skin side down for 3-4 minutes until skin is crispy. Throw in a knob of butter, flip fish over to cook for a further 2 minutes, pouring spoonfuls of butter over the top – continue until opaque and cooked through. 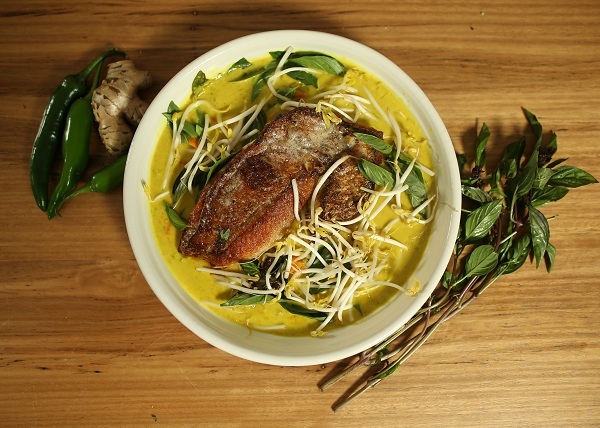 To serve, pour curry into a serving bowl, removing any lemongrass stalks, top with fish and garnish with freshly picked Thai basil leaves and beansprouts.